Be Part of Our Clean Future! Support SWR Today! Your support would make real sustainable change in Waterloo region! Our event sponsors are leading local organizations that are contributing to the growing culture of environmental sustainability in organizations across Waterloo Region. Showcase your organization as a community leader in sustainability! 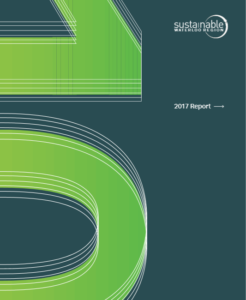 Gain profile and participation at Sustainable Waterloo Region events throughout the season, alongside local leaders from business, government, academia and the non-profit sector. 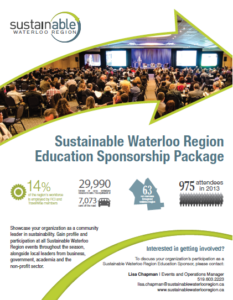 Sustainable Waterloo Region hosts many community and member events each year, with over 1,000 people attending annually. Gain profile and create brand awareness with a progressive audience by sponsoring our annual event series. Please download our sponsorship package here. Opportunities from as little as $500 per year!